The Japanese were secretly setting the stage, of which the United States would have a first row seat. 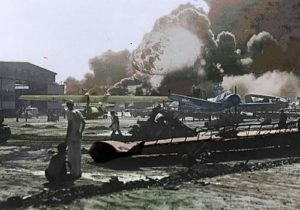 On December 7, 1941, the curtain opens, and Pearl Harbor is attacked. Stunned, but not entirely unprepared, the country is officially lurched into the clutches of World War II. Faced with the startling realization, that the West Coast was now extremely vulnerable to enemy attack, a series of defense plans were quickly drafted, and the nation began to fully mobilize. Several months earlier, a different stage was being set. This time, the stage was across the Pacific, in the sleepy coastal town of Tillamook, Oregon. Perhaps it was the typical cool, and overcast day there, when a mysterious survey team arrived. Pleased with their findings, members of the Civil Aeronautics Authority (CAA) approached Tillamook County, and proclaimed their offer to construct a hard-surface runway. To their absolute amazement, the county refused. With airfields being of prime importance to national security, the CAA swiftly upped the stakes. A phenomenal offer of $400,000 was placed on the table, which was intended to construct the airport. But even then, the county nonchalantly shrugged its shoulders at the proposal. Although Tillamook County was intrigued by the offer, it simply could not afford to acquire the needed land, and it feared the high maintenance costs that would be involved. As a final act of desperation, the CAA reduced the original land requirement from 640 acres, to a meager 200. Eventually the county agreed, and construction of a 4,000 foot paved runway, was set to begin in December 1941. Meanwhile, yet another survey team had descended upon this small dairy town. The U.S. Navy had just finished formalizing plans to place LTA bases along the East Coast, when it began to eye the potential of Tillamook. Located about six miles from the Pacific Ocean, the town of Tillamook is situated on a bed of relatively flat land, and surrounded by a semi-circle of gently rolling hills. This was exactly what the Navy had been seeking. Not only was there an abundance of timber available here, but should an LTA base be constructed, it could watch over the mouth of the Columbia River, which served as a vital supply line. By the time that the Japanese Royal Navy had attacked Pearl Harbor, there was no longer any doubt, that a great plan would soon unfold here. The formal announcement came in June 1942: a naval air station would be constructed near Tillamook, and a new LTA squadron would be formed. The onset of World War II brought about a change that the U.S. Navy would be for the most part, not expect. Although it had already surveyed several locations that were ideal for airship operations, it now needed to construct several new hangars to house the 48 recently commissioned K-class blimps. Traditionally, nearly all of the LTA hangars previously built, had been constructed from steel; however, the national steel reserve was now being utilized in other more vital war preparations. This naturally forced engineers to consider alternative building materials and methods. The nation had gained some valuable structural experience, when it constructed two enormous “clamshell” hangars of steel. But, this did little to solve their current dilemma. What was eventually proposed, would lead to yet another grand experiment: a free-standing wooden hangar. Because of their immense size, many came to doubt that this endeavor would prove practical, if at all possible. In fact, nothing like this had ever been attempted, so the technicalities would have to be resolved “on-the-fly”. Taking this into consideration, a 1/4″ scale model was carefully crafted to test various theories and applications. From this, engineers were able gain such an invaluable insight, that the actual construction of the wooden hangars, varied remarkably little from the test model itself. An unprecedented amount of timber would be needed for immediate construction. 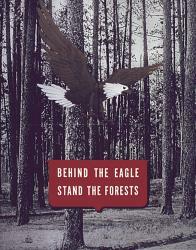 Fortunately, the thriving forests of Oregon, provided an overly abundant source of local lumber. All told, about 2 1/2 million board feet would be required for each hanger, and nearly another 5 1/2 million for the buildings needed to support the LTA base itself. Of the 17 new hangars proposed, most would be constructed entirely from Oregon Douglas Fir. There were a few exceptions, especially when an LTA base was being built near its own source of timber. In this case, California Redwood, or Southern Yellow Pine was often favored. 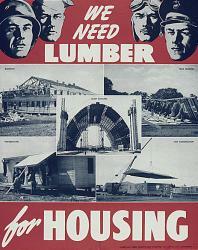 But even then, Oregon still continued to supply the majority of the lumber used during construction. 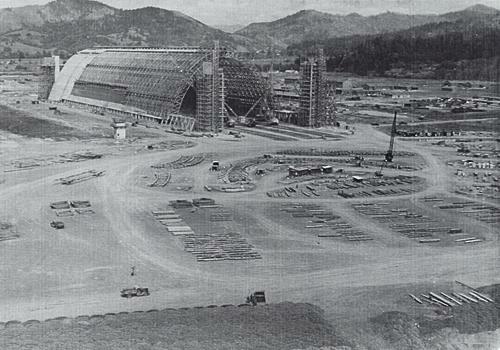 By early 1942, several auxiliary support bases had already been identified, when work began on the massive 4,900 foot hard-surface runway first proposed by the CAA; however, the actual ground breaking for NAS Tillamook would not occur for several more months, when in August of the same year, construction began on key structures of the naval air base itself. Although several bids were submitted for review, the contract for the support buildings, was eventually awarded to the Sound Construction Company, headquartered in nearby Portland, Oregon.